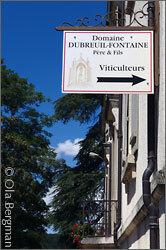 t the top of Côte de Beaune, behind the Corton hill, is Pernand-Vergelesses hidden in a charming valley. Most of the village is tightly squeezed together up on one of the hillsides. If you enter the village from the top, coming from Magny-les-Villers, you face the streets so steep and narrow that the last thing you want is meeting one of the vineyard tractors. Down below the village is the road from Beaune that leads up to Echevronne and the rest of the Hautes-Côtes de Beaune. If you go up through the village and then west around and up the Frétille hill you arrive at a lovely picnic area overlooking the village. The view from here is splendid. You have Pernand-Vergelesses and its vineyards right below and in the distance you see Beaune and the plains. There is a large open grass area the size of a couple of football fields as well as a few picnic tables. 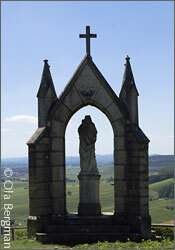 At the edge of the plateau – 490 metres above sea level – you find the monument of Notre Dame de Bonne Espérance. This was erected in 1855 as a result of the efforts of Madame de Blic. This is the only commune along the Côte d'Or to offer both red and white wine on all four levels – grand cru, premier cru, village and regional. Pernand-Vergelesses shares the Corton hill with Aloxe-Corton and Ladoix-Serrigny, giving the village 17.26 ha of grand cru land. The Pernand part of the Corton hill is the only place on the Côte de Beaune where the vineyards have a western exposition. In cooler years this can be a problem, resulting in less than optimum ripeness. 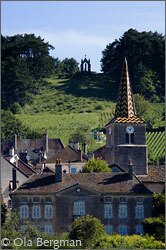 But as with other lesser-known villages Pernand-Vergelesses can be very good value for money, if carefully chosen. The five premier crus that allow pinot noir are all south of the village, on both sides of the Beaune road, close to the Corton hill. Ile-des-Vergelesses, sandwiched between the Vergelesses of Savigny-lès-Beaune and Pernand's Les Vergelesses, is generally considered superior to the other four – Les Vergelesses (or Les Basses-Vergelesses), En Caradeux, La Creux-de-la-Net and Les Fichots. 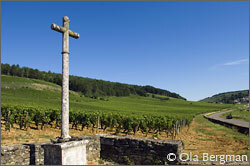 In En Caradeux you will find the Clos de la Croix de Pierre, a lieu-dit owned by Beaune négociants Louis Jadot. It was acquired by Madame Jadot (who passed away in 2006) in 1968 and covers 2.80 ha. It is easy to locate; as the name suggests there is a large stone cross right by it. You will find at the northern tip of Ile des Vergelesses. The Clos de la Croix de Pierre is not officially an appellation, but Jadot has always been allowed to use it on the label. Up here you also have a very good view of Pernand-Vergelesses and its twelfth century church. In 2001 three white premier crus were added to the village's portfolio – Clos Berthet, Clos le Village and Sous Frétille, all located up behind the village towards Magny-les-Villers. Clos Berthet is the monopole of Domaine Dubreuil-Fontaine Père & Fils and Clos le Village is the monopole of Domaine Rapet. Sous Frétille is made by several producers – Domaine Rapet, Domaine Antonin Guyon, Domaine Ludovic Belin, Domaine Denis, Domaine Pavelot, Domaine Gabriel Muskovac, Domaine Philippe Delarche etc. Here on this page you see two images from the Clos de la Croix de Pierre, with around hundred years between them. 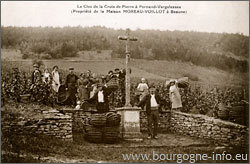 The old postcard, with the people grouped around the stone cross at harvest time, is from the beginning of the 20th century. At the time the Clos de la Croix de Pierre was owned by Beaune négociants Maison Moreau-Voillot. Already 20 years ago Henri Cannard commented on these climats in his book "Pernand-Vergelesses et son Vignoble", saying that thanks to a soil similar to the one on the Corton hill and an orientation to the south the wines were of premier cru quality. – Clos Berthet is a vineyard which is 1.5 ha, explains Christine Gruère at Domaine Dubreuil-Fontaine in Pernand-Vergelesses. 1 ha is planted in white and 0.5 in red. The white part became premier cru, while the red part stays in the village category. The vineyard has been in the family since the 1950's. Just outside the village on the Route des Vergelesses and overlooking the vineyards of Corton-Charlemagne and the village itself is the Michelin-starred restaurant Le Charlemagne, run by Laurent Peugeot. The cuisine is a mix of Japanese and Burgundian. Vergelesses was added to Pernand in 1922. Before that the village was called Vernantum, Pernancum and Pernacum until it eventually became Pernant in the 12th century. The name is of Celtic origin. Nan was the word for source and the same origin can be found in other village names, such as Arcenant only eight kilometres north of Pernand-Vergelesses. Charles Martel, who ruled over all three of the Frankish kingdoms – Austrasia, Neustria and Burgundy – in the early eighth century, owned vineyards in this region and passed them on to his grandson Charlemagne. The vines then stayed in the possession of Charlemagne until 775, when they were donated to the Collégiale de Saulieu. Legend has it that the emperor Charlemagne had the vineyards replanted with grapes for white wine since the red wine originally produced there tended to stain his long white beard. In 1924 Jacques Copeau (1879–1949) left Paris, where he had founded Théâtre du Vieux-Colombier in 1913, and settled in Pernand-Vergelesses. He began his career as a theatre critic, but went on to become highly influential in French theatre as director, producer, actor and playwright. Albert Camus later said that "in the history of the French theatre, there are two periods: before Copeau and after Copeau". 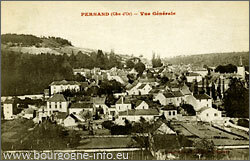 The postcard above, with the view over Pernand-Vergelesses and the Frétille hill up behind to the left, is from around 1900.